1 map : col. ; 70 x 100 cm. composed and published from surveys deposited in the Office of the Right Honourable the Lords of Trade by J.F.W. Des Barres. 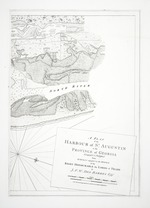 Published in the author's Charts of the coast and harbours of New England. London : 1780.
v^ :*: *^ *^: *? *^ .4 5 :'- 7 ^. ; ..-"^ -*d-^ dv *'~ ::- .- *. Al^ ,, ': \ -- -, . "^"; "v~^ '^ ^w ^ c" ~- ~ . i/ '-'*. .*/ <- -/ '" >' -<*' .